Normandy is known as the breadbasket of France but we think it should be renamed the fish platter; the salad bowl; the meat dish; the cheese-board and the entire cream-based dessert trolley of France. If you like food, then look no further than this green and pleasant land. Normandy owes much of its gourmet reputation to the lush orchards, green pastures and lengthy coastline which provide some of France’s best-loved delicacies. Oysters, lobster and mussels from Cancale; rich creamy cheeses from Camembert, Pont l’Évêque and Livarot (to name but a few); the best rabbit, duck and the juiciest steaks all hail from the region as do the gutsier and bloodier chitterling sausages Andouille de Vire. All this washed down with crisp apple cider, sparkling Poiré from Domfront and, of course, the pièce de résistance in these parts: Calvados, a potent apple brandy that is enjoyed from dawn to dusk and believed to be a cure for all ills. If there’s one thing our guests are guaranteed to leave with and that’s bags full of fabulous food. We have many great restaurants in the area, including two Michelin standard restaurants within half an hour of the house. There is a huge range of eateries from the most formal, to the more casual and then the positively unassuming, where Madame serves whatever she feels like cooking that day. We have created a list of local restaurants that are tried and tested by our good selves (tough, we know, but someone had to do it!) with details of price, type of cuisine and a general review. 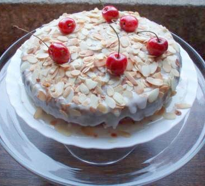 The list is left in your gite and we are always happy to make reservations in French on your behalf. 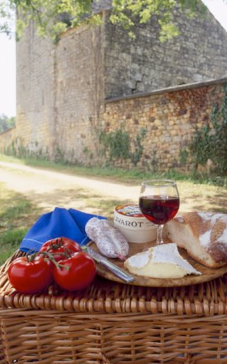 Of course, you don’t have to eat out to experience Normandy’s culinary delights. 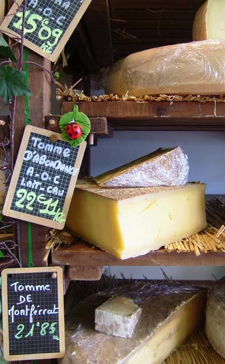 Head to the market in St. Hilaire on Wednesdays and you will find no end of gourmet treats, all of which can be cooked up in the comfort of your own gite, enjoyed al fresco as a picnic in the park or on the barbecue in the garden. Santé!